Looking for high yields? This trio of stocks with yields of 6% or more should be on your watchlist today. There's no magic number when it comes to dividend yields, though you do have to consider the risk of dividend cuts as yields rise. That said, not every high yield is a big risk, and 6% is a zone in which you can find some great bargains backed by companies where there's little risk of a dividend cut. This is why investors can rest comfortably owning high-yielding Enterprise Products Partners L.P. (NYSE:EPD), Vermilion Energy Inc. (NYSE:VET), and W. P. Carey Inc. (NYSE:WPC). This trio offers big yields with very little risk of a disruption to the income streams they throw off -- you just have to know the full story to understand what's going on. Enterprise Products Partners' distribution yield is hovering around 6% at the time of this writing, squeaking onto the list. The thing is, even if the yield were a little lower than 6%, it would still be worth owning. Enterprise is one of the largest and most diversified midstream energy partnerships in North America. The yield is a reflection of the midstream sector being out of favor today and management's decision to temporarily slow distribution growth. The slowdown in distribution growth is related to a move to self-fund more of the energy giant's growth. The goal is to reduce the need to issue dilutive units as a source of capital, which becomes problematic when the unit price is relatively low (as it is today). However, once this transition period is complete and current investments start to generate cash, distribution growth should increase from today's low single digits back to the historical mid-single-digit level. And you get to collect a roughly 6% yield while you wait for Enterprise to become a better investment option. It should also be noted that Enterprise has a pretty impressive distribution history behind it. The payout has been increased every single quarter for 56 consecutive quarters (its annual streak is even more impressive at 21 years). And through the first six months of 2018, distribution coverage was 1.5 times, a huge coverage number. Historically, 1.2 times was the target, which is also pretty impressive distribution coverage. If you are looking for a big yield, Enterprise should be on your list today. Vermilion Energy isn't a name most investors have heard of. It is a Canadian company with interests in oil and gas producing assets in North America, Europe, and Australia. The yield is currently 6.7% or so. The company doesn't increase its dividend every year, but the long-term trend is toward higher payments (which are made monthly). And, notably, the driller didn't cut its distribution during the deep oil downturn that started in mid-2014. 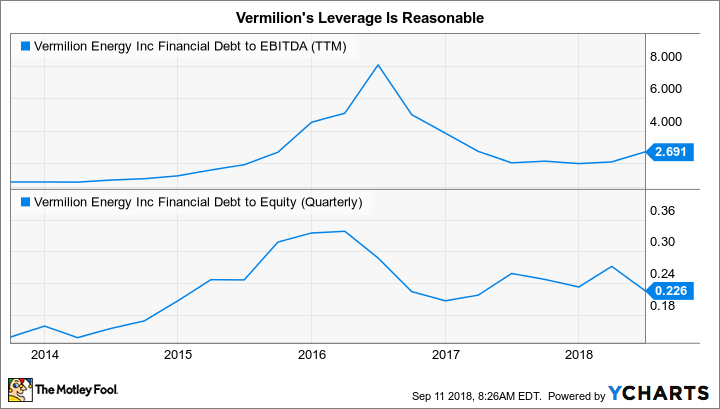 Although Vermilion's leverage is a little high, with debt to EBITDA at around 2.7 times, it is not unreasonable. Debt to equity, for example, is a modest 0.23 times. Oil prices play a large role in the company's performance, but Vermilion managed through the recent downturn very well while continuing to reward investors with hefty dividends. There's no reason to think that's going to change at this point. 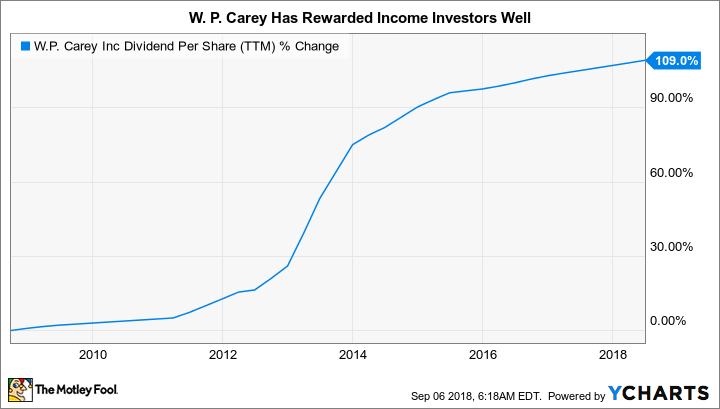 W. P. Carey is a triple-net-lease real estate investment trust (REIT). This means that its lessees pay to maintain the properties they occupy. The business is really about ensuring there's a healthy spread between the cost of capital to buy a property and the rent it generates. Carey does this by focusing on off-market transactions in which it can design its lease agreements. Very often, this means buying properties from companies that need cash for some reason, usually for expansion and acquisition activity. That's not unique; there are plenty of REITs that focus on owning triple-net-lease assets. What separates Carey is its diversification. It generates around a third of revenues from outside of the United States (mostly Europe), and its portfolio is spread across the industrial (29% of rents), office (24%), retail (16%), warehouse (16%), self-storage (5%), and "other" (10%) categories. That's a level of diversification that is rare for a REIT, and it allows Carey to invest opportunistically wherever it sees the most value. The dividend, meanwhile, has been increased for 21 consecutive years. The current yield is a robust 6.2%. WPC Dividend Per Share (TTM) data by YCharts. Right now, Carey is going through a transition. Historically, it operated an asset management business in which it sold and ran nontraded REITs along with its owned-property portfolio. That led to a discount relative to peers that were solely focused on owning properties, which is a less volatile business. Carey is currently dismantling the asset management business, including buying one of its largest sponsored nontraded REITs. It will take a few more years for the transition to be fully completed, but as Carey's business shifts more toward its owned portfolio, investors are likely to reward it with a higher price. If you're willing to wait through the process, however, you can start collecting a nice yield right now. When you look at stocks with high yields, you need to think about the safety of the dividend checks you receive. But if you take the time to understand the stories behind the stocks you are buying, you can find nice 6% yields that should be safe for years to come. Now that you have a little more background on Enterprise, Vermilion, and Carey, I think you'll find that one or more could be a nice fit for your income portfolio.